I am shaking in my figurative boots right now as I prepare for bed in Pamplona, Spain. Tomorrow when I wake, I’ll be eating a boiled egg and fruit, drinking a coffee, pulling on my ‘day’ clothes and shaking in my literal walking shoes as I start the first day of my one month pilgrimage across Spain. Starting from the Spanish town of Pamplona, I’ll be making my way about 700 kilometres west along the famous Camino Frances trail (also known as the French Way), following the footsteps tread by hundreds of years of pilgrims. Although traditionally a Christian pilgrimage, the way is now also walked by intrepid and troubled spirits from across the globe. Reading about the Camino over the past few months, I’ve heard stories of great sadness and accomplishment; stories of 90 year old walkers and those suffering illnesses, of people who’ve lost loved ones, or those who have nothing. But for me, a generally happy traveller from Australia, joining the Camino trail is about something else, although it is hard to articulate exactly what…. Perhaps it is about adventure and the Spanish countryside, as well as about being free and wild. Perhaps it has to do with the challenge of letting go, of following my feet and my heart, about letting my mind quiet and trusting that the path with provide. It could also be about ego; saying I did it, proving that I can, that my body is stronger than it seems. Perhaps. For now, all I am sure of is that I’ve sent most of my possessions to Santiago de Compostella. I have shoes and a small pack. I have a supportive partner who is ready to walk with me. And I’m in Spain. It seems that the best thing to do is face my anxiety and just go. Along the way I’ll be keeping you updated, telling you stories, sharing my tips, posting photos of the Spanish countryside. I will also be posting stories from my recent one-month stay in Istanbul, Turkey, as well as stories and tips about my few days in Barcelona and Pamplona, Spain. To get all the gory details, make sure you follow me here on WordPress, as well as on Facebook and Twitter. In the last two days three people whose blogs I follow have said that they are about to take the Pilgrim’s Trail! Coincidence or a Message? Perhaps I need to dust off my boots and get walking! I’ve visited Santiago de Compostela but I cheated and went by car! Perhaps your brain knows its time and is seeking the pilgrim sources for your Andrew? I’ll let you know how it goes, but I imagine it will be a different view from that you;ve seen so far. BTW, thanks for all your wonderful Spain resources. I’ve been enjoying them and sending them to friends who will meet me here at the end of my pilgrimage. They are a wonderful travel planning tool! Best of luck on the trail – very impressive! Boy are you going to be fit! Reading your blog is really giving me itchy feet….. Thanks Christine. This is the place to be for itchy feet! Just completed my 1st day my Camino. Walked 23km from Pamplona to Puente la Reina-Gares, past wind turbine farms, fields of yellow and paths lined with wild flowers. Think I’m going to love this journey! Hi Nic. This is Ana from Pamplona. I just read your e-mail and wanted to know how you guys are doing. You made it to Puente la Reina! Not bad for the first day. Ánimo and buen camino! (I think you´ll hear that a lot). Ana. Hi Ana, Great to hear from you! Thanks for reading. We are now in Estella and feeling good. We’ve been working on our ‘buen camino’ with every passer-by and think we are getting closer to the correct Spanish pronounciation 🙂 Thanks again for having us! It was lovely to meet you in Pamplona. We have a blog that is exceptionally well-written, funny, and moving travelogue of a mother and son’s journeys both on Spain’s 500-mile pilgrimage, the Camino de Santiago, and through challenges of cancer and divorce, soon to be published as a book! I love reading everyone’s different journey’s … they all are truly something! Buen Camino! Hey Candace, Thanks for stopping by. Buen Camino! Thanks for letting me know about your blog! I’ll be stopping by to have a good read. You’re right – everyone has an interesting and heartening story about their journey. This is a great post, thank you so much for sharing your experience. I am starting the walk this August so I’ll be following your travels closely! Thanks for reading. I am sorry to hear about your friend’s father. It is a terrible thing to loose someone close to such an awful disease. I met many people along the Camino walking for similar reasons. I think you will find the trail offers a lot of insight about health, quality of life, purpose and loss… and a lot of people who are discovering the same things along the same trail. I’ve actually finished my walk now. You can read my final post about the Camino here > http://wp.me/p12XwO-FG . Also, I have posts in between about my travels, so have a little scroll through the right side bar for Camino posts. 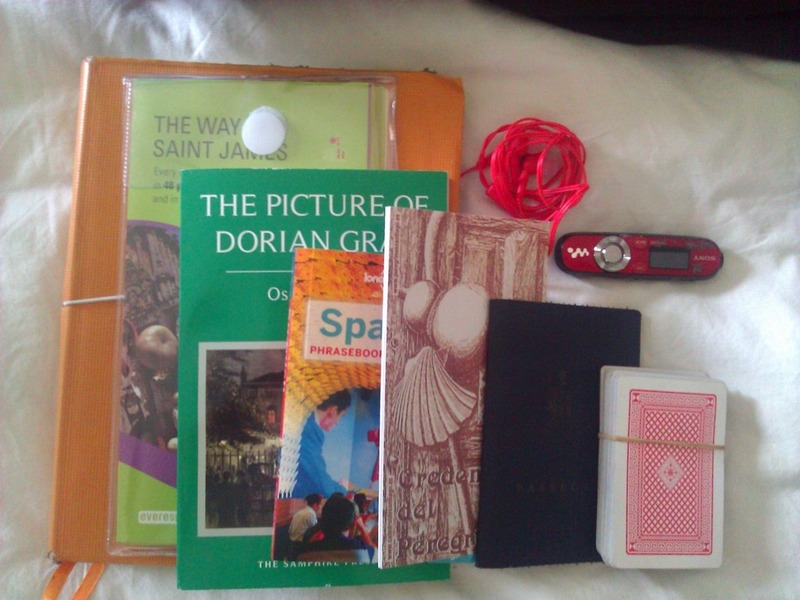 I’m also in the process of typing up my key lessons from the Camino and my version of a packing guide, so stay tuned. Another fantastic source of Camino insight is http://www.ottsworld.com a travel site by Sherry Otts, who also recently walked the Camino. If you have any questions about the way, feel free to email me > mail@nicfreeman.com < and I'll do my best to help. All the best. Buen Camino. Hello. I am Ana from Pamplona. Congratulations to both of you. I just read what you wrote on the 9th of June, when you arrived to Santiago. My son Jon was just there last friday, he went to see Jork. (by train both ways). Lovely to hear from you! Thanks for the message. Yes, we arrived, with a few injuries along the way, but so glad we did it! It is strange to think that there is a train going there when we walked – we must have been mad hey? Spain was wonderful. After Santiago, we went to San Sebastian briefly to meet friends, then Granada, La Herradurra, Ronda and Cordoba, before coming over to Morocco, where we are now. Lots of wonderful memories of Spain, including staying with you in Pamplona. We have decided that Pamplona is one of our favourites of the trip, so thank you again for hosting us! Nice article. Thx for sharing!